To make your visuals even more interesting, we have stocked an assorment of popular props that live right here at Studio Space Atlanta. No need to truck your props in, you can rent them onsite and have it inatantly. We are always adding new interesting props. Listed below is a few of them. 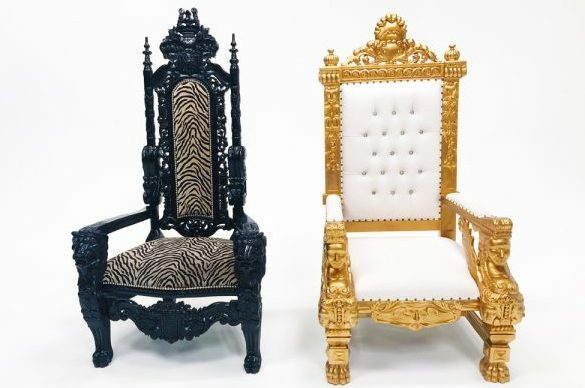 We have 2 King Thrones (one Black $75, and One Gold and White $90). Both are beautifully hand crafted and adds style to any photo shoot or music video..
53 total 6 foot tall letters, all of the alpabet times 2 plus a hashtag, We are the only studio in Atlanta that has 6 foot letter props, if you see them in a video… the video was filmed here. This one of a kind 5 foot variable speed motorized turntable provides that clean 360º motion you have always wanted. This turntable is not shy in front of cameras and can handle an amazing 1,500lbs. It does not have just one speed, our turntable can be turtle slow to lightning fast and everything in between. With a 5 foot diameter there is not much you can’t fit on this beast! Getting creative and need a last minute accent piece for your photo shoot? Here it is! Get wild with our Leopard Chaise. This beautiful King crown goes great with our King Throne.. or maybe you just want it to feel like royalty while you are filming. This 8ft traffic light is a fun add on to a scene, You can switch the light to green, red or yellow individually or all at once. Go vintage with this antique television set. Green screen the glass and put what ever you want on vintage TV. Go medieval with your production! 2 different swords to choose from.